When Quoyle’s two-timing wife meets her just desserts, he retreats with his two daughters to his ancestral home on the starkly beautiful Newfoundland coast, where a rich cast of local characters and family members all play a part in Quoyle’s struggle to reclaim his life. As Quoyle confronts his private demons — and the unpredictable forces of nature and society — he begins to see the possibility of love without pain or misery. I know it probably is not wise to bring to mood down so early on into this endeavour, but I feel after the five star and highly praised books we need to even it out a little. I often find myself reading books that people define as a ‘classic’. That horrid little term which, to quote the other annoyingly quoted man Mark Twain, ‘is something that everybody wants to have read but nobody wants to read’. 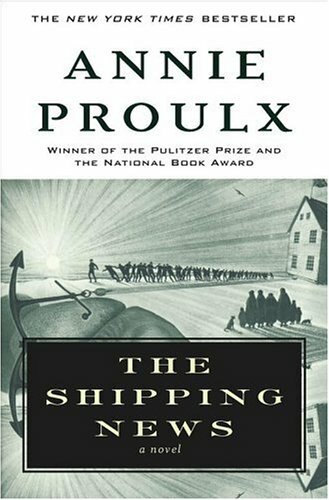 But I have indeed read some of these classics, one such being The Shipping News, something which according to Amazon Books, “shows why Annie Proulx is recognised as one of the most gifted and original writers in America today”. Yeah no. I had to first read this book for my Extension English class in 2005 and much to the annoyance of my teacher it took me six months to finish it. I just did not like this book. I couldn’t get into it, I didn’t like any of the characters or the narrative whatsoever. Then of course we had to watch the film with Kevin Spacey, and I apologise to Mr Spacey because now every time I see him in a film I think back to this horrid movie and it makes me dislike him. Very bad I know. There wasn’t anything in there that I hated especially about it, it was just that it bored me to tears and I simply dreaded picking it up again. I think I only smiled once through the whole thing and that was because one chapter opened up with a joke which was a little bad but very clever at the same time. Other than that I have no idea why people love this. I have seen reviews that talk about the beauty of Newfoundland and the intense character of Quoyle, but to me it is irrelevant. I don’t care how much Proulx describes the wonderful location, the fact we have to read about Quoyle’s drab life in Newfoundland is enough to cancel out any beautiful imagery. It is certainly a love or hate book I have discovered. I have come across a few of these. They somehow manage to divide people into five star ratings or one, maybe two. There is so much in this book that could have made it intriguing: Quoyle’s wife Petal and all her issues, the fact Quoyle must raise his daughters after his sea change from New York, even the mystery surrounding Quoyle’s ancestral history in the town isn’t strong enough to actually make you interested or care. Instead we watch this man slowly sinking and no matter how hard he fights he barely stays above water. Even when things start going well for him the mood does not change, we may as well be back at square one where everything crumbles around him. As the years pass and people still talk about this book I wondered if whether my age had anything to do my interpretation of reading this story. Was it the fact I was 17 and had this book thrust upon me for the sake of study? I would like to say no because I can recall so many other books that we had to study at school that I adored, even the strange science one On Giants’ Shoulders by Melvyn Bragg . I loved that book. So based on that, I stand by my argument that this book was simply slow and dull and by having the long and dull movie thrust upon me as well did not make me appreciate the book any more. As a character Quoyle annoyed me, his life seems to be a continual monotone of nothing, but what was worse was that so was his personality. Away from narrative, the way Proulx had written this story was disagreeable as well. I understood the connection and significance of the ropes and knot references but the way her sentences flowed and were constructed just got up my nose. I know books don’t suit everyone so I understand people out there loved it, but just for those people who see it being raved about and then hate it yourself, you are not alone and are not one of the weird people who “don’t understand the classics”. I hope you take that away with you because remember, one day there will be a book you adore and no one else will understand why. Remind them of this moment. Previous The Book of Lost Things by John Connolly Next Happy Australia Day!